Pizza is a crowd-pleasing choice for busy weeknights and fun weekend dinners alike. But you don't have to rely on restaurants or takeout for top-notch pizza. Read on for tips on how to make your own pizza at home. We'll walk you through how to make pizza crust, how to top a pizza, pizza baking temperature, and how long to bake pizza. Plus, we'll share some of our favorite homemade pizza recipes to try. Let's start with the base, the crispy crust that holds it all together. With the crust, you can go a few ways: 1. You can make homemade pizza with store-bought dough;2. Use pre-baked crusts (such as Boboli) or even English muffins and pita bread for personal pizzas; 3. Make your own pizza dough. 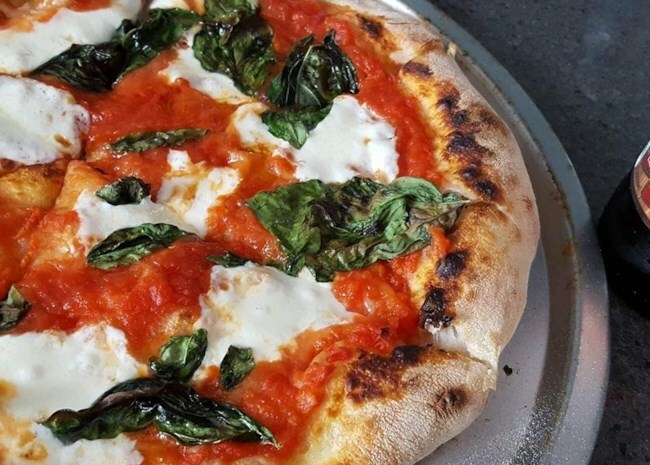 Here's how Chef John makes simple no-knead pizza dough. (He also makes a pretty mean Cauliflower Pizza Crust.) Watch the video to see exactly how the pizza dough should look before setting it aside to rise. You'll also see Chef John's patented “rotate, stretch, and tuck” move for forming the dough. Now for the sauce. There are loads of delicious pre-made marinara sauces for pizza sauce. We have oodles of homemade pizza sauce recipes. Beyond red pizza sauces, don't forget pesto sauces, white sauces, or even a simple olive oil and garlic sauce. They will expand your pizza potential by almost infinite proportions. For more on mixing and matching pizza sauces and toppings, check out 20 Ways to Make Homemade Pizza. There's almost no limit to the toppings you can pile on a pizza. Tomato sauce and pepperoni you know. But apples and walnuts? For sure. Fresh figs and prosciutto? Of course! Sweet corn and peas? Well, in Europe and Japan, corn and peas are common pizza toppings. Bottom line, pizza is open to an infinite amount of creativity where toppings are concerned. Breakfast Pizza topped with crumbled bacon, diced red and green peppers, and fried eggs. Chicken and Broccoli layered with pesto or with an alfredo sauce instead of the traditional red sauce. Veggie Lovers is great as anything can go on it. Throw any odds and ends of veggies onto a bakesheet and roast them in the oven, then use Harissa for the base sauce. And to keep it simple, use a mix of mozzarella and Parmesan for the cheese. Taco Pizza works great. It's such an economical choice, and the ingredients are always stocked in the pantry. For the sauce, it's usually a puree of black beans or refried beans, and then layers of traditional taco fixings. Almost BLT Pizza. A variation on the classic sandwich using bacon, spinach and sundried tomatoes. Once you have your toppings lined up, think about the order you'll lay them down on the crust. It matters! Layer the ingredients one way, and you have pizza perfection. Arrange the same ingredients in a different order...and it's curtains. For example, if you put the cheese down first, then layer tomatoes and basil on top, the basil burns and shrivels and the cheese doesn't brown. Possible pizza fail. Of course, you can put tomato slices on top of the cheese. Tomatoes have a high moisture content, so they won't caramelize; instead, they'll dehydrate slightly for a more concentrated tomato flavor. Mozzarella, Fontina, and Parmesan cheeses all work great. These cheeses are all very low in moisture, so they'll brown fairly quickly. Now let's get this thing in the oven! 1. Heat the oven. Generally, the hotter the oven, the better the pizza will be. The best oven temperature for pizza is between 450 and 500 degrees F (250 to 260 degrees C). How to cook pizza on a stone: Place a pizza stone on a lower oven rack. Preheat the oven between 450 and 500 degrees F (250 to 260 degrees C) — the stone needs heat up while the oven heats. Large, thick-crusted pizzas might need an oven temperature closer to 400 degrees F (200 degrees C) so the crust can cook completely before the toppings burn. Tip: For a crunchy crust, preheat a baking sheet or cast iron skillet in the bottom of the oven. Once you load the pizza, toss ice cubes into the hot pan to create a burst of steam. You know another way to get a terrific crust? Put your pizza on the grill. 2. Form the pizza dough and place it on a peel dusted with a little flour or cornmeal. If you like, lightly brush the crust with olive oil. This helps create a golden brown, crispy crust rather than a dry, dusty outer crust. See how to make and form your pizza dough. Okay, the oven is hot and the pizza's all topped and ready to roll. 3. Slip the pizza onto the hot pizza stone. Tip: Jjiggle the peel to make sure the pizza isn't sticking. You want it to slide off the peel easily. If it's stuck, gently lift the sticky dough and dust with a wee bit more flour or cornmeal. Place the tip of the peel on the edge of the stone at the back of the oven. With one swift motion, jerk the peel back out from under the pizza. If the pizza slides freely on the peel, it should land perfectly in the middle of the pizza stone. If the pizza sticks to the peel, your toppings will slide off the pizza onto the stone, and the kids will hear you say those words you're not really supposed to use in front of them. Close the oven door and let the pizza bake. 4. After 5 minutes of baking, check the pizza. If some spots are browning faster than others, turn the pizza; slip the peel underneath it like a giant spatula. Rotate the pizza on the peel and return it to the baking stone using the same swift motion described above. If you like, remove the pizza from the oven halfway during baking to brush more oil on the crust. This added oil will help darken the crust and make it even tastier. For a little garlic flavor, infuse the oil with minced garlic. 5. The pizza is done when the cheese is melted to a medium-to-dark brown. Color means flavor. Carefully remove the pizza with the peel and let it cool slightly. If you want, top it with additional fresh toppings. Slice with a pizza wheel or chef's knife, and serve to your adoring crowd. Feel the Burn: When pizza scalds the roof of your mouth, don't blame the cheese. Most likely, it's the sauce. That's because heat is conserved in the wet sauce; and an insulating layer of cheese is very likely adding insult to injury. Next time you get a slice fresh from the oven, lift the heat-trapping lid of cheese with a fork, and you'll see how the steam pours off the hot, hot sauce. It's like the molten core of the earth in there. Check out our complete collection of Pizza Recipes.